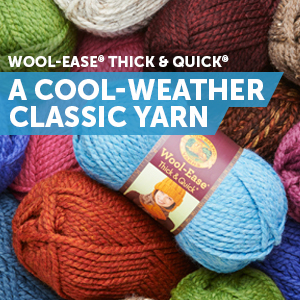 When I went to Michael’s and saw this gorgeous Lion Brand Wool-Ease Thick & Quick yarn, I knew immediately what I wanted to make with it. It was so gorgeous and reminded me of snow. Since winter is almost in full swing here, I decided to make a cowl for my little munchkin. Kaylee loves scarves and loves the snow so I knew she would love this cowl. It’s a quick and super easy pattern that can be worked up in about an hour. Check out the pattern for Kaylee’s Snowy Day Cowl! Row 1: Dc in the 4th ch from hook. *Sc in next st, dc in next st.** Repeat from * to ** until the last st. Sc in the last st. Turn. Row 2: Ch 3 (This will count as your first dc) Sk first sc. *Sc in the next st, dc in next st** Repeat until the last st. Sc in the tch. Turn. Row 3-32: Repeat Row 2. Leave a very long tail for sewing the 2 ends of the cowl together. Working on the wrong side, place the two ends together. Using the yarn needle and the long tail, sew the ends together using a whip stitch. Weave any extra ends. And that is it, you are all done! Get the supplies for this project and help support my blog by making your purchase through my affiliate links! Would this work up to be too small for 9 and 10 year olds? If so, how do I adapt it to come out larger than a toddler size? Thank you in advance for any help. Hi Cynthia! It might be a little snug. You could just add a few more rows before you seam it together to make it a bit longer. I hope that helps! So cute for little girls. hey thanks for the beautifulcowl.if i understood i make a sc in every sc of row below and adc on e ery dc?? Hi Christine, you will be making a sc in the top of every dc and a dc in the top of every sc.